Iron Man Avery, Arnold Palmer’s caddie for all four of his Masters wins, finally has a gravestone more than three decades after his death. Will Avery has felt the pressure cooker of college basketball at Duke for the 1999 NCAA Championship Game and in the NBA as a first-round draft pick of the Minnesota Timberwolves. The Augusta, Ga., native traveled the world, playing professionally in the Middle East and Europe for a decade before coming home to start a career as a coach and camp organizer. But for more than half of his life, the 39-year-old Avery didn’t know much about his most famous predecessor in the sports spotlight. He knew there was a pedigree of top-flight golf caddies in his family, beginning two generations before with great uncles and continuing with his father and uncles, all with ties to Augusta National Golf Club. But the story of Iron Man, his famous great uncle Nathaniel, was lost in time, especially since Iron Man died at age 46 in 1985, a broken man, when Will was just age 5. There are so many inspiring stories told in the new caddie documentary, Loopers: The Caddie’s Long Walk. There’s the climb of Carl Jackson and Greg Puga from inner-city upbringings to prominence within the caddie profession. See Fanny Sunesson and her ascension to sidekick for the world’s No. 1 player in an all-male workplace. Or experience the whole lot of caddies over the centuries in Ireland and Scotland treating visitors to their hard-edged whit and knowledge. But one of the encounters within the caddying world tugged at my heart more than others… and had so for nearly 20 years. Before Tony Stark’s Marvel superhero or Black Sabbath’s heavy metal song brought the title to greater prominence, there was the original Iron Man, who stood so tall beside Arnold Palmer when he made golf and the Masters Tournament so famous on television beginning in the late 1950s. The youngest of eight children, he hung out in the caddie yard in the early 1950s, learning from his older brother, Big Henry Avery, the longtime Augusta Country Club caddie master who is responsible for giving many of Augusta National’s caddies their humorously appropriate nicknames. As a 115-pound kid, little Nathaniel boasted that he could carry the heaviest bag of the day’s rounds and come back for more. That was the first time, he said in a mid-1960s interview, that someone jokingly called him Iron Man, even though that nickname would thrive with fanciful stories of fingers being chopped off in an ax accident, a knife fight or via a drunken encounter with powerful firecrackers. Just as fantastic were the ventures off the course. In Palmer’s first Masters victory in 1958, it was the intention to pay a caddie fee of $1,400, but Arnie’s wife Winnie was overcome by the moment and hurriedly wrote a check for $14,000 — more than Palmer’s $11,250 first prize — and Iron Man’s check was later reissued. When Palmer won his second Masters in 1960, he was staggering down the stretch before Iron Man asked him in the 15th fairway, “Mr. Palmer … are we chokin’?” Perturbed, Palmer birdied the last two holes to win. Palmer admitted years later that he didn’t rely on Iron Man for yardage or green reading, but the man’s presence made Palmer smell victory. Just when you think that Iron Man was “just there” and not an essential part of the team, consider his above contributions and that in the 1950s and early 1960s it was highly unusual for the press to write about a caddie. They were considered just bag toters and not worthy of a story, especially if they were black during that sorry time in American history. But Iron Man broke through that invisible curtain to become one of the first caddies that the press went to for insight. “He just hitch his trousers, jerk on his glove, starts walking fast and says, ‘The game is on,’” Iron Man told the Associated Press following Palmer’s third Masters win in 1962. “When Mr. Arnold do that, everybody better watch out. He’s gonna stampede anything in his way. … I been almost in his pocket on every hole. Sometime he goes with my advice — and it better be right. If I mis-club him, he don’t chastise me. He just look a little mean, and I feel like going through the ground. But he is a great man. But this golf version of Iron Man was virtually forgotten to relatives and golf fans, lost in black-and-white stories, flamboyant quotes and outlandish off-course behavior in a player-caddie tandem more suitable for Hollywood. A half-century after Palmer and Iron Man split as a team in 1968, the only way you could find out what happened to Iron Man was to visit the office of Southview Cemetery in downtown Augusta, Ga. Grave No. 3, Lot 12, Section G held Iron Man’s remains. No marker existed. You can’t blame family, as Iron Man squandered any notoriety and winnings and separated himself from family. Palmer lost track as the years passed. When I was writing the 2004 book, Men On The Bag: The Caddies of Augusta National, my impetus was to reveal the people behind the nicknames. Who was “Cemetery,” President Eisenhower’s caddie? How about “Stovepipe,” on Gene Sarazen’s bag when the Squire made double eagle on No. 15 in 1935? Or Willie Peterson, the first caddie I researched as his daughter, Vanessa Peterson-Fox, called the Augusta Chronicle sports department in 1999 to report the death of her father, five times on Jack Nicklaus’s winning bag. I served as the Chronicle sports editor at the time. I, too, lost the tug of that story until 2015 when film executive Jim Packer made a cold call to brainstorm his idea of developing a wide-ranging tale of caddies, what they do and why it’s so important. By 2017, we were wrapping up much of the film’s storyline on Augusta caddies and I voiced that it was important to finally put Iron Man to rest. We had Iron Man in the film, but not his end story, which is told in an extra that was released in March, and is also available at loopersmovie.com. A dear Augusta friend, former sportscaster and historian Stan Byrdy, helped us document the end of the road. We worked with Julius Clark, the Southview Cemetery owner, to make sure that there was a casket below the perceived Iron Man grave site. 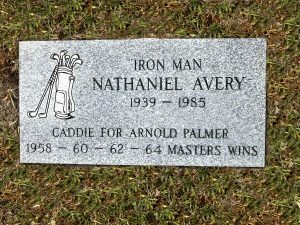 A marker was funded by an anonymous donor, with a design to recognize the Masters wins and lead with the Iron Man moniker. 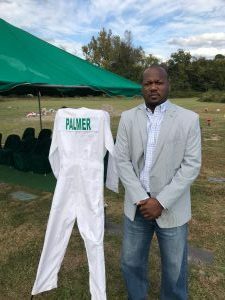 The Palmer Company, just a year after Arnie’s death in September 2016, gave their blessing, as did the Avery family, with Will Avery leading the way. 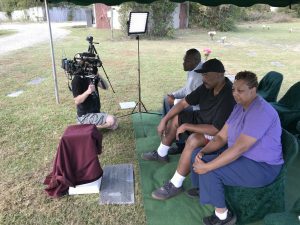 By late October 2017, the marker was ready and some of the Avery family gathered for an informal ceremony at Southview Cemetery to put a name on a place where none existed for 32 years. Just 100 yards away rests Willie “Pappy” Stokes, the five-time Masters winning caddie, twice for Ben Hogan, and the Augusta National caddie corps’ “godfather.” He has a military marker because of his service in World War II. Peterson is buried four miles away in Cedar Grove Cemetery. The total number of Masters wins: 14. It’s an inner city of caddie royalty. Henry Avery Jr., unearthed what was probably his uncle’s final Augusta National caddie card, a collectible ID passed along from uncle to nephew that “I keep in a safe place,” he said. If you ever have a moment, it would be worth a stop at Southview Cemetery, 1102 Nellieville Road. It’s quiet, about five miles away from the bustle of the Washington Road area near Augusta National. It should be a Masters golf landmark. “This could be a museum, not a cemetery,” Will Avery said. It’s also an appropriate memorial. I’m proud to say we were able to make happen.